Antonella and I have embarked on what we hope will be a fairly comprehensive retrospective of Italian Cinema in an attempt to answer one deceptively simple question, “What the hell went wrong? !” How did one of the most imaginative and inspired national cinemas of the 40s, 50s, 60s, and 70s become so vapid and uninteresting during the 80s, 90s and 00s? Was it the advent of video? Or the changing nature of Hollywood distribution? Perhaps it’s more closely related with the vicissitudes of Cinecittà? We don’t exactly know just yet, but we will find out! More than anything, it offers us an amazing opportunity to really explore and relish some of the masterpieces of Italian cinema. Recently we have been working through a number of Pier Paolo Pasolini’s films, and I really enjoy the elegiac poems the he manages to frame for the camera. We recently watched Mamma Roma (1962), Il Vangelo secondo Matteo (The Gospel According to St Matthew, 1964 -which was horribly dubbed in English making in unwatchable for Antonella, but made for a very interesting b-movie experience for yours truly), Comizi d’amore (The Assembly of Love, 1964), Uccellacci e uccellini (The Hawks and the Sparrows, 1966), and Teorema (1968). When I find a bit more time I’ll go into depth about our discussions of all these films, and their are some great interviews with Pasolini wherein he talks about the convergence of art, cinema, and politics as well as his own beautifully poetic notions about history, Marxism, and capitalism. In the mean time, however, I wanted to talk briefly about Uccellacci e uccellini which features two of my favorite figures of Italian cinema: Pasolini and the brilliant comic actor Antonio de Curtis, whose stage name was Totò. Totò was a giant of cinematic comedy -his film persona has much in common with Charlie Chaplin’s Tramp, and in many ways he embodies a beautifully compassionate figure of an eroding patriarchy throughout the western world. He is a clown in the richest sense of that long tradition, representing a critical and subversive vision of post-war Italy. Antonella and I spent much of the time immediately before and after September 11th at the Brooklyn Academy of Music where we drank in the films from the “Totò Recall” retrospective like therapeutic medicine. In a moment of national crisis, Totò offered a compassionate and deeply hopeful means of coming to terms with the horrors that immediately surrounded us. He spoke to us from the war-torn landscape of a post-bellum Italy -working the ineffable magic of one of the last -if not the last– truly great humanistic comedic actors. Totò is so important to me these days as a reminder of the deeply dark and painful impulse of great comedy, unlike current popular figures like Jon Stewart or Steven Colbert, his humor was driven by a deep-seated respect and love of his fellow travelers rather then guided by a logic of cynicism, contempt, and violent satire. Our comedy is a product of our moment, the beauty of film is that we can return to another moment and re-imagine the power to connect with one another in some real and meaningful ways like Totò connected with me during a moment of extreme terror and seemingly endless uncertainty. Totò deserves an entire blog unto himself (what do you think of Totòfridays? 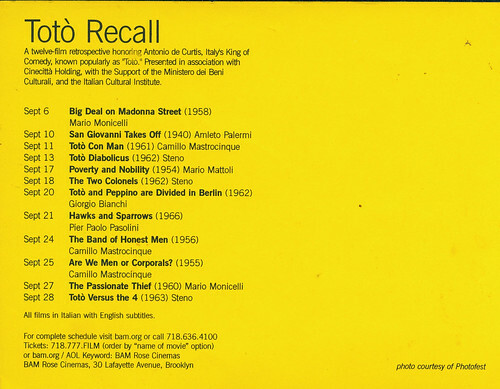 ), but I will do my best to re-visit this really important retrospective of Totò’s work at the BAM that seemed almost divinely planned in terms of contemporary relevance. But, I indulgently digress, Pasolini’s Uccellacci e uccellini is an elegiac poem about the state of Italian leftist politics in the mid -1960s. The film takes place in an exurban wasteland and features the peripatetic peregrinations of Totò and his son throughout the slums on the outskirts of Rome. The film features a talking crow who represents “the so called- left-wing intellectual of the kind of those living before Palmiro Togliatti’s death.” The crow tells the wanderers a tale of medieval times wherein two friars preach to the hawks and the sparrows. They were successful in preaching the commandment of love unto them separately, but were unable to get them to love each other (link). The hawks still feed on the sparrows, and the powerful continue to prey on the weak and disenfranchised. The film reads like a poetic history of the Italian left, towards the end incorporates footage from the funeral of the founder of Italy’s Communist party, Palmiro Togliatti, a stark break from the fable-like logic of the rest of the film. 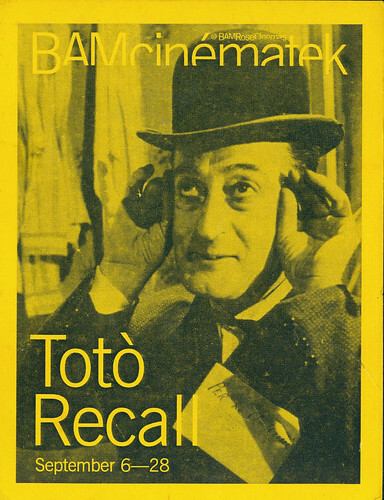 This is reported to be Pasolini’s favorite of the numerous films he made, yet critics and fans of Pasolini oscillate between extreme reactions of favor for Totò’s masterful dramatic performance and its aesthetic exploration of a “Pure Marxism,” or disfavor given the overt attention paid to Marxist ideology and the miscasting of Totò in a rather less than comedic role. Be that as it may, my own favorite scene from the film is what I glibly refer to in the title as Pasolini’s Italian Dance party. The following sequence comes very early on in the film, and marks a moment that features some of my personal favorite film music from Ennio Morricone. I love the energy with which Pasolini consistently infuses the younger, working-class characters in his films. He films this raw talent with so much affection that the kinetic love of these images is burned on my consciousness. This entry was posted in film, films and tagged BAM, Brooklyn Academy of Music, Italian Cinema, Piero Paolo Pasolini, Totò. Bookmark the permalink. That’s a terrific clip at the end. I’ve never seen the movie. Theorem, though, remains one of my favorite films. I love that you are commenting on this old gold post, Toto and Pasolini are two of my favorite Italians of all time. When you combine them it’s magic 🙂 PLus how about the Morricone score? Magic.